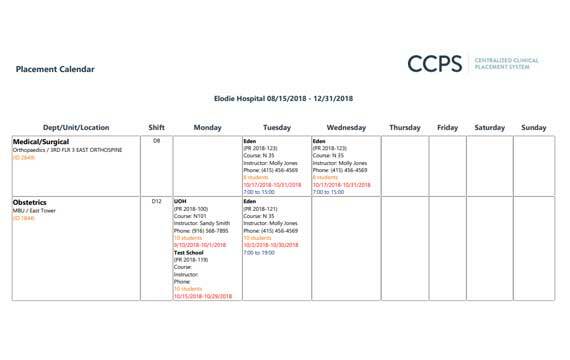 The Centralized Clinical Placement System (CCPS) offers a collaborative approach to scheduling clinical placements. A streamlined, standardized process makes it easy for schools and providers to schedule clinical experiences. Time-saving historical placement request process. Schools use just one form to provide the information needed to best match clinical placement availability. Provider/School affiliation agreement tracking and management. Easily generate reports and view real-time data through our secure, cloud-based system. 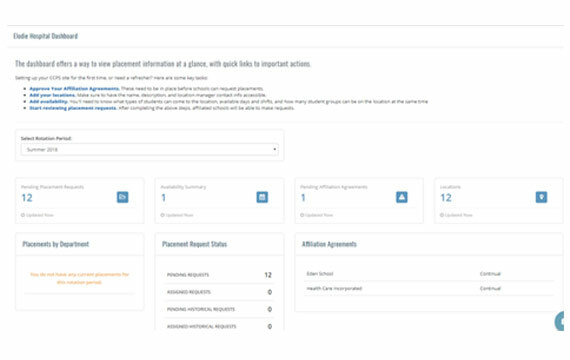 View placement and availabilities across an entire organization. Track community benefit and clinical placement trends. Easily export data for viewing and sharing with your team. The system identifies untapped clinical availabilities, increasing the number of placements and facilitating the expansion of healthcare programs. 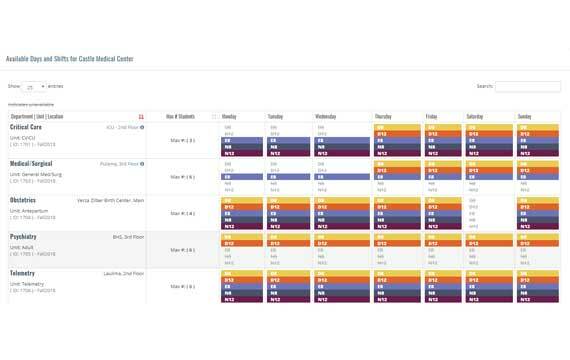 Dynamic availability calendar helps identify placement opportunities and open availability at a glance. Improved request process allows greater time-savings and increased flexibility in securing the best fit placements. Custom dashboard displays at-a-glance view of site activity. Specify the type of placements, affiliated partners, and availability for your organization. User-informed quarterly releases ensure the platform is built to meet your needs. Our cloud-based system allows for scalability and security, and gives you access to your data from any device, any time. No software to load. A regional perspective supports the expansion of healthcare education programs, helping expose untapped clinical opportunities. Implementation planning, support, and training are available to assist new regions and users. Since 2004, CCPS has supported schools and clinical providers and is used nationwide by more than 500 schools, clinics, and hospitals. Learn more about how CCPS can benefit your region. CCPS was designed by the Foundation for California Community Colleges, in partnership with HealthImpact, funded through a grant from the Gordon and Betty Moore Foundation. CCPS is used in regions nationwide and has been active for over 12 years. Subscribe to our mailing list now to stay informed about the latest CCPS updates.